Brooklyn group consisted of Pat Flugieri (Lead Tenor),Sonny 'Augie' Pirillo (Falsetto/ Tenor) ,Jerry Giamonco (Bass) and Ben Lanzarone (Piano). -Open Up Your Heart/The Slower You're Alone.Gee Records-1956. -Ka Joom/A Hundred Million Lies.Warner Records-1957. 1956 Unreleased sides on the Gee label_I Wonder / Please Be My Love. 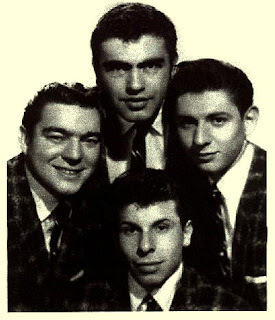 Gee records were owened by George Goldner and the group auditioned for him in the house of Frankie Lymon later they were recorded their first single were booked into the Apollo Theater with an Alan Freed show on November, 23 1956 with other Goldner's groups as The Harptones, the Cleftones or The Pretenders. In 1957 recorded as The Dynamics and disbanded.